And of course, most of important of all for this week, the country that my camerawork fails to do any justice to: India 2013. The sun was setting as we pulled into Amritsar's railway station, a grand British edifice although tastelessly adorned with numerous faux cupolas since independence. I hailed a rickshaw for the short journey to the Golden Temple, although when we had to cross the railway tracks that I had just ridden in on, it all proved too much for the wallah so I got out and helped him push. I was dropped off just a few metres short of the temple compound and I booked myself into the first hotel that I saw, the 600 rupees p/n 'Golden Castle Rooms' where I got an early night in order to be fresh and bright in the morning to experience what I had travelled all this way to see. I was up early and eager and out of the hotel by the time that the clock struck nine. I had chosen not to visit the Golden Temple the night before because this was what I had come to India to see, the main impetus behind the entire trip and so if I was going to do it, I would do it properly and savour every holy moment as is only proper for such a sacred site. I bought an orange bandanna with the Khalsa symbol and “Golden Temple” printed across the front in both English and Punjabi, (covering one's head is mandatory within the temple compound), and then went to the vast cloakroom to deposit my shoes, (where I also picked up some free Sikh literature for my students' perusal), and then, after ritually washing my feet, walked into the compound itself. The Golden Temple – or 'Hari Mandir Sahib' as it is known in Punjabi – is the holiest shrine in Sikhism, although I must admit to being a bit puzzled as to why. It was founded in 1577 by the Fourth Guru, Guru Ram Das, who was granted the land by the famously tolerant Mughal Emperor Akbar. He began to excavate the pool and invited traders to set up around the site, in essence establishing a Sikh holy capital, Guru Ka Cak (modern-day Amritsar). The excavations were finished by the Fifth Guru, Guru Arjan, who then built the original gurdwara in the centre. The site then developed as the centre of the Sikh World until the Sixth Guru, Guru Hargobind, was forced to abandon it in the early 17th century after coming under attack from the (now far less tolerant) Mughals. However, afterwards it was rebuilt and has remained the principal shrine of Sikhism ever since, although as I alluded to earlier, that surprises me somewhat since it has no connection with the founder of the faith, Guru Nanak,1 and has precious little to do with the Tenth and final living Guru, Guru Gobind Singh. Nonetheless, ever since I first saw a picture back in that classroom in Ormskirk of that tiny temple seemingly floating in its pool of clear blue waters, surrounded on all sides by ornate white buildings, then I knew that this was a place that I would have to visit before I died. 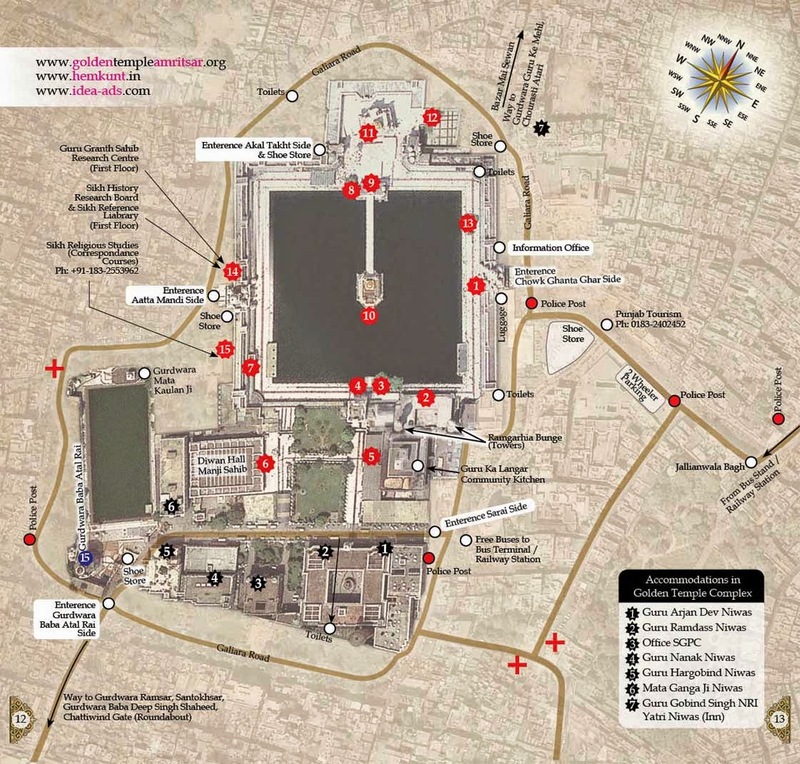 I circumnavigated the Amrit Sarovar2 clockwise, stopping off at the relevant places of interest. I deliberately hadn't eaten so I stopped off at the langar behind the two watchtowers, (which I'd always assumed to be minarets belonging to a mosque beyond the compound. As at Sis Ganj, I found the langar a humbling and beautiful experience. There I was, sat cross-legged in a row with a hundred others. The woman on my left looked rich, perhaps an emigrant or local businesswoman, whilst the man on my right was filthy, perhaps a beggar or farm labourer. Yet for that meal we were equal. No one thought it improper that one of obviously another faith, let alone another race, was sat there partaking in the food, just as no one thought it improper that a woman was sat touching shoulders with a non-related man, nor that a rich man such as I was brushing clothes with the lowest on the social scale. And what of the Khalsa Sikhs who were serving us? They all looked well-heeled, perhaps community leaders used to ordering about those whom they now waited on, and I have not even mentioned the countless unseen volunteers who prepared, transported and donated the food. No, despite the inequalities and unfairness of the world, for that brief meal we were equal, just as we are eternally in the eyes of God. In the langar Heaven itself is glimpsed. Is there any better and more fitting tribute to the beautiful theology of Nanak? Alas, all of us other religions have, at times, a lot to learn. After the langar I continued round the Amrit Sarovar, past Ath Sath Triath, the Baba Dip Singh Shrine and round the parikarama to the Hari Mandir Sahib itself. There was a lengthy queue waiting to go inside the temple and I joined them and fell into conversation with a Khalsa Sikh from Coventry who was on pilgrimage with his (devastatingly pretty) daughter. He explained that it was busy because it was a holy day3 although apparently everyday there are always throngs of worshippers. Inside the temple it was crowded indeed, particularly on the ground floor where devotees crowded around the granthi4 who was chanting aloud from the Guru Granith Sahib – the eternal Guru of the Sikhs – accompanied by ragis.5 I moved upstairs where there was a little more room and there in an alcove on the eastern wall I sat cross-legged and lost myself in meditation as the sacred chanting washed over me. The Hari Mandir Sahib truly is a beautiful building. We all know what it looks like from the outside, its exterior of glittering gold gracing a thousand sacred images, but inside it has its own particular beauty too. Unlike many sacred sites of global importance, it is small and intimate, built on a human scale in stark contrast to many of Europe's great cathedrals, the Levant's famous mosques and indeed other notable gurdwaras that I have visited. It is ornate but tastefully so; no one could ever abuse it with the labels of 'tacky' or gaudy' which are sadly only too applicable for many holy sites including a good number of gurdwaras. Its architecture is classically Mughal to me which should come as no surprise as the present temple dates from 1765. I reflected as I sat there how, in so many ways, with its sacred pool, square shape and even the name 'mandir', the Golden Temple reminds me of a Hindu mandir. But there is one key difference: no idol is to be found here, no image of a god, instead only the book for the book, the Guru Granith Sahib is the only object worthy of veneration for, following the death of Guru Gobind Singh in 1708, that has been the eternal living Guru of all Sikhs. After meditating I made my way up onto the roof where another copy of the Guru Granith Sahib was being read by another granthi, before making my way down and out along the causeway and back to the parikarama. Then I investigated the Akal Takht, the building at the eastern end of the causeway, set at a slight angle to the rest of the complex. That is traditionally where the Takht (Sikh parliament) meets and it represents the temporal presence of the Guru whilst the Hari Mandir Sahib symbolises the spiritual. From an historical perspective though, this building is of little interest since all but a fragment of it is under thirty years old, the original structure being almost completely destroyed by Indian artillery during the traumatic assault on the temple in 1984 known as Operation Blue Star. Operation Blue Star, still indescribably dirty words for the majority of today's Sikhs, had its roots in the activities of the Akalis, the Sikh “Guardians”, a movement that seized control of principal gurdwaras from other branches of the faith, (particularly the Udasis – more on them later) during the 19th and early 20th centuries and had begun to act as a political and spiritual leading authority for Sikhism. After Indian Independence in 1948 they began to demand more independence and autonomy from the Indian government, a process which culminated in 1966 in the Punjab being recognised as a state of India, (previously it had been lumped in together with Haryana). Contrary to quietening things down however, this concession emboldened the Akalis to start demanding for even more autonomy right up to full independence for the Sikh-majority state which they referred to as Khalistan (Land of the Khalsa). This set the Akalis on a collision course with the government of Indira Gandhi and with neither side willing to back down, the result was a full on military assault on the Akali stronghold: the Golden Temple compound. That assault was codenamed 'Operation Blue Star' and it still evokes controversy to this day. Holed up and heavily-armed in the Akal Takht was Bhindranwale, the fiery Akali leader, with his most hardened supporters. That was beyond doubt. What Indira Gandhi miscalculated though, was the support that he had amongst the Sikhs. Many did not support Bhindranwale, including General Ranjit Singh Dayal, one of the commanders of the government forces, but when the tanks rolled into the temple compound on the 5th June, 1984 and blew up the Akal Takht, virtually all were horrified at the sacrilege. The Sikhs inside fought to the last man but by the morning of the 6th June all were dead. The episode ignited Sikh anger with many feeling that they could no longer live within India and calls for an independent Khalistan only grew stronger. Then, on the 31st October, whilst walking from her house to do a BBC TV interview in her office next-door, Prime Minister Indira Gandhi was assassinated by her own Sikh bodyguards in retaliation for the desecration of the Golden Temple. India erupted into communal violence which, when everything subsided, left a Sikh death toll in its thousands. Since then things have calmed down. True, Khalistan sympathisers occupied the Golden Temple a second time in February 1987, but this time the government had learnt its lesson, (perhaps the most controversial aspect of Operation Blue Star was that most analysts believe that Bhindranwale could have been defeated without a bullet being fired, simply by starving or gassing him out), and only the police entered the compound this time and were careful not to desecrate any holy places. Khalistan is still mentioned occasionally – my Sikh assistant came into class one day soon after I returned from India wearing a T-shirt declaring 'Khalistan: It's our right!' but most support these days comes from ex-pats like him and not those who would actually have to live in the country if it ever did achieve independence. And finally, as a footnote, as an act of reconciliation, the Indian government immediately rebuilt the Akal Takht but that is not the building that I visited: as soon as it was finished and the Indian Army had left the compound, this new Akal Takht was torn down by the Akalis who declared it to be “unclean” and then rebuilt it exactly the same. The langar shows Sikhism at its best; you can be the judge of what that action shows. Returning to the parikarama where once Indira's tanks had rolled, I sat down cross-legged and meditated. The chanting of the granthi in the Golden Temple itself was relayed over loudspeakers and once again I let it envelope me. I stayed there for some time, connecting with God and trying to make sense of the holy place in which I was sat. Then, so taken by it all, I decided to make a video expressing my feelings. Watching it back now, whilst I know that it will never win any awards for camera-work or script, I am startled by how immediate ad fresh it is. The effect that the Golden Temple had had on me is there for all to see. 1I have heard of a tradition which states that Guru Nanak visited the site and possibly started excavations on the pool but this is far from being central to Sikh beliefs. 2The pool from which the city AMRIT SARovar gets its name, (in English it translates as 'Pool of Nectar'). 3The 14/02/13, although try as I might, I never managed to find out why that particular day was holy, (aside from being St. Valentine's Day of course). 4Reader of the Guru Granith Sahib. 5Musicians in the band playing music to accompany the reading. Excellent narration. It would have been hard to educate the Student with that Khalistan written on his T- shirt. Happy to know that you had a godly moment. Gaganjeet, thanks! I had a really godly moment at the Harimandir sahib and would love to return one day and also visit other Sikh holy sites. I find the figure of Guru Nanak in particular to be inspirational, a truly godly spiritual seeker! I heard there is one gurdwara in the mountains which I shall try to visit one day. Check out "Basics Of Sikhi" on youtube. Its a very good channel to learn more about the meaning of life. Josh, I'm a semi-regular visitor to Basics of Sikhi and I like the channel plus would love to hear him speak sometime. However, if there is a criticism of him, it is that he always puts forward a very orthodox Khalsa Sikh perspective and I would like to hear him discuss about other Sikh strands more. Thanks for the comment and keep visiting!